1) There's hardly any detailed official documentation published about their early history, even from their keeper, the National Grid, an organisation that is also evasive in other possibly relevant matters, e.g. they state that "the very first [National Grid] annual report published in 1926" is on their website, but it isn't. 2) They look like overbearing stick-people guarding a magic force, and/or the giant steel skeletons of laser-skinned robots after an apocalyptic interplanetary war, and/or terrible trojan-horse-like wicker men filled with nothing but the ominous buzzing of the Old Ones. 3) If you're drunk, stoned or otherwise altered enough you can see pentagrams in them (some actually have pentagrams built in their framework). 5) In the late-1920s the architectural luminary Sir Reginald Blomfield collaborated on the first standard tower design submitted by Milliken Brothers. (The National Grid website incorrectly says he was brought in in 1931.) Although they could have been constructed in almost any shape and would have still functioned the same, he based their design on, and named them after, the 'pylon': a tapering gatewayto ancient Egyptian temples. Blomfield was an established Establishment figure (a member of the Royal Academy, etc.) and took commissions from prominent Freemasons, so was probably one of the Brotherhood himself. The final shape merged the two elements of the ancient Egyptian pylon into a single one like an obelisk. The Freemasons have always had a thing for these phallic pillars and have been erecting them all over the UK (often as war memorials) both before and after their high-voltage counterparts. 6) The first-ever National Grid electricity pylon to be built in the UK was at Bonnyfield in Scotland, on 14 July 1928 (the unreliable National Grid website just says it was built "near Edinburgh" - about 30 miles from Bonnyfield - in "January 1928"). Bonnyfield is less than a mile away from Bonnybridge, better known as Scotland's "UFO Capital", due to the frequency of flying saucer reports in the vicinity since 1992. 7) The nation was warned of pylon perniciousness in early-1975 by the first broadcast of the BBC's doom-laden children's TV series The Changes (adapted from Peter Dickinson's novel The Devil's Children), that depicts a violent, anti-technological revolt by Britain's inhabitants who later leave the country. This madness is triggered by a sound apparently emitted by electricity pylons. Many years later medical research has proved the harmful effects that pylons do actually beam on people. "There's something in the air..."
8) As part of their strategy to appear non-threatening, pylons obsess certain people and influence them to create zany, fun websites, such as the lady who formed the Pylon Appreciation Society and the guy who runs the Pylon of the Month website. This is done to disguise the pylons' occult purpose on earth, in which they inspire the spawning of more serious and shadowy pylon-worshipping cults, such as the unnamed UFO-related one active in the Cergy-Pontoise region of France in 1980 (Leonard Lander, Beyond The Dial, ORB Editions, February 2009, p.54), and New Zealand's "chaos monks", who around Y2K used to "meet monthly by the steel foot of the first pylon after the 47th exit south of A.K." (Circuit 47 zine, Issue 4 ). In the UK, on 8 September 1987 two security guards patrolling the (then under construction) Stocksbridge bypass road at Deepcar witnessed a "hooded figure" who then vanished. 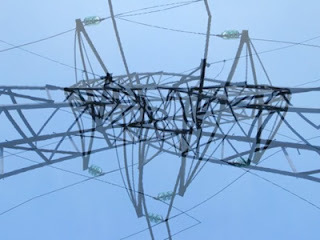 The two men then saw some small children dancing around an electricity pylon on the new road-bank who also vanished into thin air, leaving no trace in the mud (Paul Devereux, etc., Earth Lights Revelation, Blandford Press, 1990, p.99). In 2015 John Rogers discovered evidence of pylon worship in the form of the remains of a fire that had been lit directly underneath a pylon in the Lower Lea Valley. According to one ex-member, pylonic rites involve the use of fluorescent light tubes as magic wands, as they will self-illuminate in close proximity to a pylon due to the live wires' residual emissions. Another has stated that the cult believes the pylon's humming in damp weather and howling in the wind contains spectral voices that can be heard and communed with in the right kind of trance. 9) In his youth, my industrial musician friend Johnno went for a solo jaunt in the mountains without map, compass or provisions. He became lost and understandably feared for his safety, the panic quickly rising. For some reason he soon got the idea to "ask the land" for a solution, and it replied "follow the pylons", which stretched across the terrain. He did, and they led him back to civilisation, and possibly saved his life. Twenty years later, on the night of Halloween 1989, he was collecting atmospherical field recordings for his new LP, and decided to make one sourced directly from a pylon atop some windswept hill far away from electromagnetic smog. This was done by a portable tape-recorder, its mic socket filled by a jack-plug with one wire attached to a copper spike pushed into the earth and the other wire wound around the pylon. When he turned up the recording level he heard a peculiar crackling static sound within a low frequency hum, that gradually morphed into a regular pulse with illegible EVP-type voice signals in the noise. A few minutes later violet corona discharges sparked around the pylon's aegis and a psychoactive aroma of ozone filled the air. At this point he suddenly felt his hackles rise, so looked behind him and saw a ghoulish man "like a Jacobean scarecrow," all dressed in black with a wide-brimmed black hat, slowly walking towards him. As their gaze locked, Johnno "could feel the sight of its eyes entering my eyes to occupy all attention." He's never said any more about it and I know not to ask. Mark Reeve is interested in this dimension, and others. As a self-taught British multimedium creative he co-founded the now-disbanded "cult cult" the OKOK Society/Research Bureau and is currently enjoying his latest project: the North Wales Psych[ic]ogeographical Network (NWPN). Pylons hide behind greyness, and reject celebration with pictures of skulls. In 1990 I saw one lose its wires after a freak snow and frozen rain storm. The resulting explosion was a beautiful bright turquoise.